I never thought that it took us almost an hour to reach the first destination of our tour, the white sand dunes of Mui Ne. The dawn was breaking and the majestic landscape of the province slowly unveiled its beauty to us. The highway was smooth until we reached the intersection. We also took notice on how the vegetation and the type of soil gradually transformed as we made our way to the white sand dunes of Mui Ne. It was 5:30AM and there were only a few tourists in the area. We didn't pay for an entrance fee, however we rented an ATV for 300,000 dongs (good for 2 persons) for 20 mins. After a quick tour, we drove ourselves to the sand dunes. Feels like I'm in the Middle East! Lai and Robbie. Shut up and drive! I can show you the world. Shining, shimmering, splendid. It was my first time to ride an ATV and it was an exhilarating experience! It was totally unexpected! I never thought that I'd be riding an ATV. Bonus part was, I rode it outside the country. It was actually a nice idea to be there early morning because we can't really imagine how hot it would get during noon time. The Vietnamese heat and humidity is worse than in the Philippines, in my own opinion. Next stop was the red sand dunes of Mui Ne. The landscape was still the same albeit the red hue of the sand, hence its name. There were more people frolicking because it's more accessible to the public. The beach was just right in front of us, actually! Our driver told us not to be complacent. Thieves were everywhere, that's why everyone needs to be extra cautious on their personal belongings. I think this principle applies whenever traveling - be in a first world country or a third world. We climbed a bit and took some photos of the red sand dunes. We even spotted a couple dressed in their wedding attire. Photo shoot right in the middle of the desert! We haven't eaten anything since four in the morning, so we decided to try some Vietnamese snack. And guess what? Vietnam has its own version of Taho! I'm sorry I forgot the name. *Insert sad face*. I even tried googling 'Vietnamese taho soy with ginger syrup' but... meh. The ingredients were the same however, instead of using the ultra sweet caramelized sugar, they use ginger syrup. It's actually refreshing and healthier. 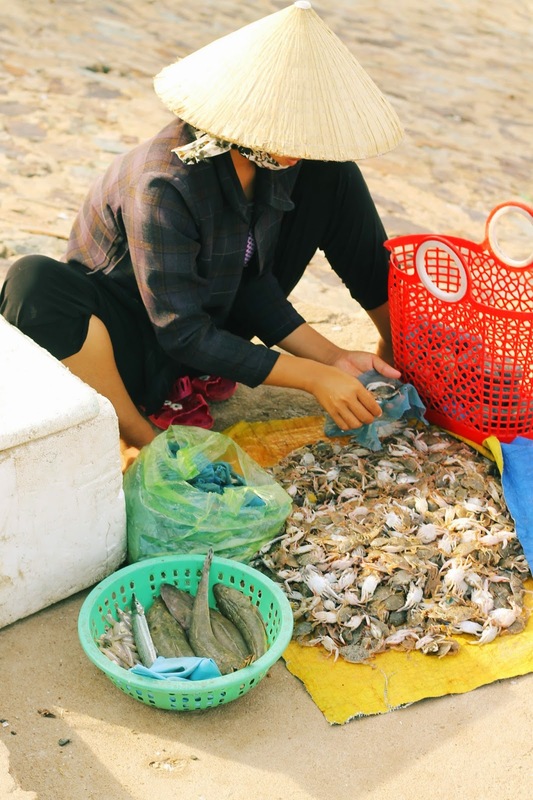 Fishing is the primary source of livelihood here in Mui Ne. Every morning, a number of fishermen wade through the rough seas in search for a good catch while their wives and children wait for them at the dock. Moreover, one can directly buy the fresh catch from them and have it cooked right in front of you after purchasing it. Life there is simple, yet everyone seemed happy. The last stop of our Mui Ne Day Tour. I didn't do any research about this day tour prior our trip thus I didn't have an idea why it was named as such. Entrance fee: 5,000 dongs per person or roughly Php 10. After paying, a local volunteered to guide us along and instructed us to take off our slippers and walk barefoot. I thought we were going to wallow on a knee-deep murky stream. I was wrong. The water was just an inch deep but clear, and the sand was brown, giving the stream a brown and murky impression. 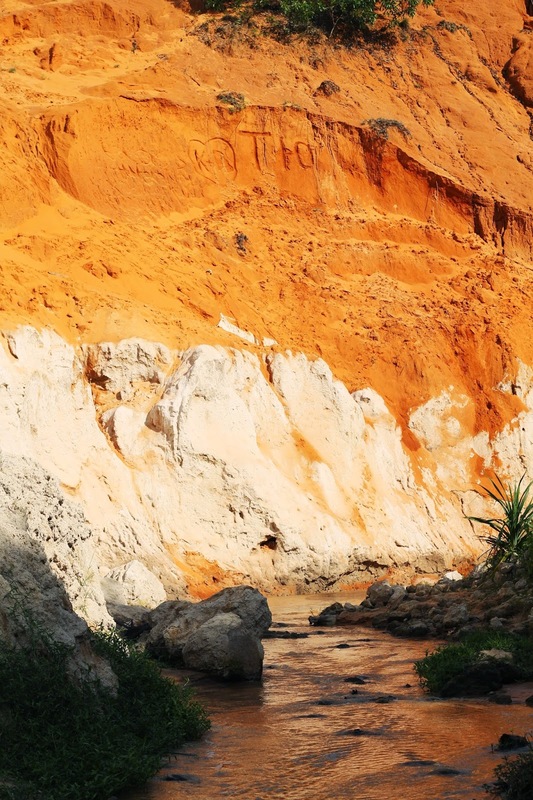 What was so astounding about the Fairy Stream was not the stream itself, but the surrounding sand formations. Yep, you read it right, SAND! The photo above is quite deceiving. At first, we thought that it was some sort of a limestone formation, but it turned out it's completely made of sand. The unique sand formation of Fairy Stream has been continuously carved by water, wind, and time thus it made me sad after seeing some vandals along the way. There's a mini zoo and cafe along the way. One can ride an ostrich (yes, an OSTRICH) for a fee but we chose not to because ostriches aren't meant to be ridden in the first place! We were having the time of our lives in Fairy Stream until our volunteer tour guide demanded us to pay him a tip worth 400,000 dongs! That was too much, considering that he didn't do much when we were touring fairy stream. In fact, he didn't even bother to look for us when we had a hard time trekking the treacherous landscape! With Lai's convincing power, we ended up paying him 200,000. Still, it was too much considering how useful he was during the tour. Don't get me wrong. I am not against to giving tips, but... gah. Plus, tips are supposed to be a voluntary act, not a compulsory thing. We went back to the hotel at around 10:30 in the morning, completely exhausted yet satisfied. Despite the minor monetary mishap, we still had a great time. Add the fact that Zenora's breakfast made our day. I can't imagine if we did this tour from 1pm-6pm. Disaster. Awesome! I always thought Vietnam has the same geographical features as ours and Thailand but definitely mistaken...I live the dessert view. How I love to experience this myself. I can show you around if you happen to visit the province where I am now. The ATV ride looks so fun. 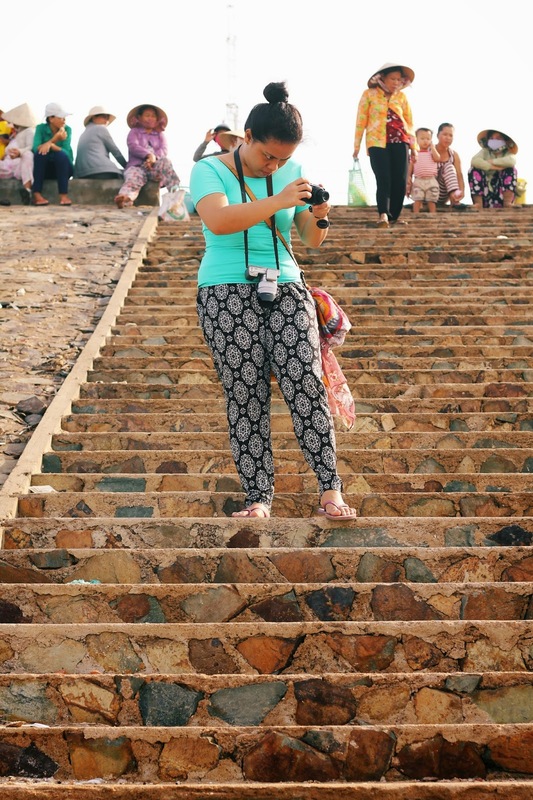 Looks like you had a lot of fun and was able to immerse with Vietnam's culture and locality. Those pictures are superb,hope you enjoyed the trip. You've done your time with so much joy and happiness. Really exciting to visit such places from far away from your home. Discover places with your own ways. The place is very nice. There's a different and unique beauty you can only found in a place if you visit early. The wedding photoshot gives a nice contrast to their clothes :) I hope the taho is still sweet even if it has ginger. I haven't seen anyone riding the ostrich. I know it's really not meant to be ridden. Haha poor ostrich. 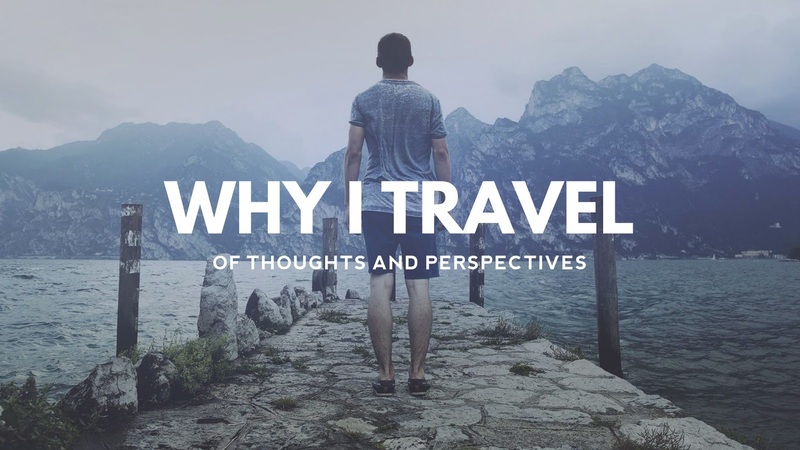 @Fernando Lahica: True, traveling is the best way to experience life. @Teri Yellow: Haha, didn't expect that wedding photoshoot though. @Rochkristin Santos: I think it's just too harsh to ride an ostrich. Of all the places I've been to, I haven't had a desert experience like this. I like to see it first hand either seeing the sand dunes there or in Laoag. You take amazing photos adn make everything there sounds fantastic.